Createspace Independent Publishing Platform, 9781541159358, 234pp. During his long career as an academic and researcher in nineteenth century France, Antoine B champ was widely known and respected as a teacher, an academic, and a researcher. As a leading academic, his work was well documented in scientific circles. Few made as much use of this fact as Louis Pasteur, who based much of his career on plagiarising and distorting B champ's research. In doing so, Pasteur secured for himself an undeserved place in the history of medical science. The Blood and its Third Element is B champ's explanation of his position, and his defense of it against Pasteur's deceptions. This final major work of B champ's embodies the culmination of his life's research. This book contains, in detail, the elements of the microzymian theory of the organization of living organisms and organic materials. 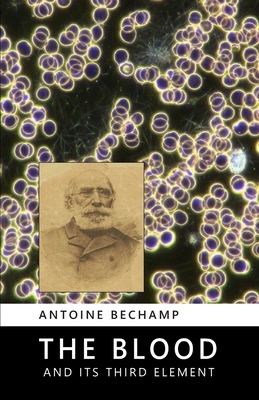 It has immediate and far reaching relevance to the fields of immunology, bacteriology, and cellular biology; and it shows that more than 100 years ago, the germ, or microbian, theory of disease was demonstrated by B champ to be without foundation. "I am LOVING this book I thought when starting class "Oh great, a hard book to read" but it has totally surprised me, and I am now having a hard time putting it down Great read for any one just looking to learn more about the body and blood and how things work..."
"This is an excellent book for knowledge seekers who do not take anything at face value. It is not an easy-read book but if you take the time to read and re-read you will gain valuable information that can strengthen your knowledge about the human body and all its elements especially the blood. I highly recommend this book for those wishing to expand their health related knowledge base"
..".what Dr. B champ is describing is a foundational concept. According to his experiments and observations, these tiny particles he named "microzymas" have an active role in sustaining and also in terminating life. Using the syllable "-zyme" (now also used in the word "enzyme") to indicate this principle of causing 'fermentation' (activity) B champ searched for and found the same particles and activity even in limestone, apparently from the ancient shelled creatures whose bodies were incorporated into the stone. They still retained their activity"
"Best book I've ever read on the fundamental elements of life. Bechamp is one of the geniuses of all time." On the nature of fibrin isolated from the clot or obtained by whipping the blood. - The blood fibrin. - Fibrinous microzymas. On the actual specific individuality of the albuminoid proximate principles. - The albuminoids. - Coagulation. The state of the fibrin in the blood at the moment of venesection. - The fibrin without microzymas. - The haematic microzymian molecular granulations. The real structure of the red blood globule. - The microzymas of the blood globules. - The blood globules in general. The real nature of the blood at the moment of bleeding. - The living parts of the blood protoplasm. The real chemical, anatomical and physiological meaning of the coagulation of the shed blood. - Coagulation of the blood. The blood is a flowing tissue and therefore spontaneously alterable. - Pasteur and the germs of the air.